Comcast or Dish: Who Can Handle Cord Cutting Better? You have probably heard of cord cutters—cable television subscribers who decide they can live without cable. Some cord cutters cut cable completely but most shift to cheaper on-demand online streaming. Bloomberg in October 2015 reported that 300,000 had cut the television cord in the third quarter. But even that was good news because it was down from 600,000 in the second quarter. What you may not have heard is that there are still 138 million subscribers to cable as of December, 2015—52 million still subscribe to cable video, 58 million to high speed internet, and 28 million to digital voice according to the National Cable and Telecommunications Association (NCTA). 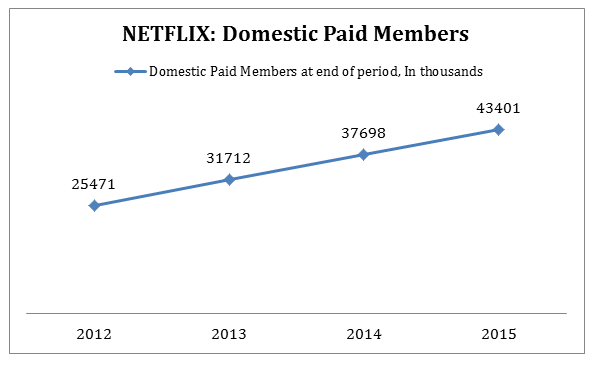 So while cord cutting is a reality, a large part of the pay TV industry’s subscriber base is still intact. Rather than being a sweeping trend, cord cutting is a process of attrition. Right now it is slowly eroding the margins of traditional pay TV’s subscriber base. This should rightly be a concern for investors as it erodes the long term growth prospects and future cash flow of cable providers. Naturally, cable providers recognize this and have taken steps to counter the erosion by starting their own online streaming TV services. Here I compare two major cable providers, Comcast (CMSCA) and Dish (DISH), to try to determine which one has better future prospects in light of cord cutting. A qualitative examination of their business models leads me to believe that Comcast, in spite its bad customer service reputation, beats Dish, and I will attempt to explain why. Note that this article will be more qualitative than quantitative, but I will follow up with a quantitative comparison in a webinar and second blog post. Both Dish and Comcast share the same subscription business model. Customers subscribe to one or two or all of their products and pay a monthly fee those services. Although the business model is the same, there are differences in how they deliver those services and additional businesses they own. Comcast is a media and technology company that operates two businesses, Comcast Cable and NBCUniversal. The two businesses are reported as five segments—Comcast Cable is reported as Cable Communications while NBCUniversal is reported in four segments Cable Networks, Broadcast Television, Filmed Entertainment and Theme Parks. Cable Communications is Comcast’s primary business and cash cow, accounting for 64% of total revenue in 2014. It is the largest provider of video, high-speed internet, and voices services in the US (under the Xfinity brand). Cable Networks, a distant second, operates regional sports and news networks and television production operations. It accounted for 14% of combined revenue. Broadcast Television, third in the revenue line at 12% of total revenue, operates 10 NBC and 17 Telemundo local television stations. Filmed Entertainment (Universal Pictures studio operations) and Theme Parks (in Orlando and Hollywood) are fourth and fifth bringing in 7% and 4%, respectively, of overall revenue in 2014. Cable Communications, also known as Comcast Cable, operates a network of hybrid fiber-optic and coaxial cables running underground and/or connected to public utilities poles through which it delivers video, high-speed internet and voice services. The business earns its money by charging subscribers monthly fees for video, high-speed internet and voice services. To grow, cable communications needs to grow the number of subscribers to its services and/or increase monthly subscription fees it charges. Dish, similar to Comcast, operates two primary businesses—DISH and Wireless. Unlike Comcast which reports its two businesses as five segments, Dish reports the two businesses as two segments. The DISH segment comprises the pay TV service named DISH, and the broadband internet service called dishNET. DISH is the golden goose accounting for almost all of total revenue. The Wireless segment manages the Dish’s wireless spectrum licenses by buying the licenses and/or investing companies with licenses. Currently, Wireless is contributing very little to overall revenue. The DISH segment operates a network of satellites, satellite dishes and receivers through which it delivers video and internet services. Its internet services mainly target rural residents who are underserved by cable. Dish makes its money by charging monthly subscription fees for its video and internet services. As in the case of Comcast, Dish needs to increase its subscriber base and/or increase subscription fees to grow. Cord cutting is a problem for both Dish and Comcast, although this is not apparent from overall numbers. Comcast, as of December 2015, had 27.7 million subscribers which was an increase of 2.6% from 27 million in December, 2014. These subscribers include single, double, and triple product customers. However, this data does not show us what is happening to the customer base. For that, we need to turn to business segment specifics. Although overall Comcast’s subscriber base is growing, it has primarily been driven—in the recent past—by growth in the number of high speed internet customers and not video content customers even though video is its main product (it brought in 47.1% of the revenue while high-speed internet fetched 25.6%). High speed internet customers grew 5.9% to 23.3 million as of December 2015, from 22 million at the end of 2014 while video customers declined 0.5% to 22.3 million from 22.4 million. Like internet subscribers, voice subscribers also grew 2.7% to 11.5 million from 11.2 million. 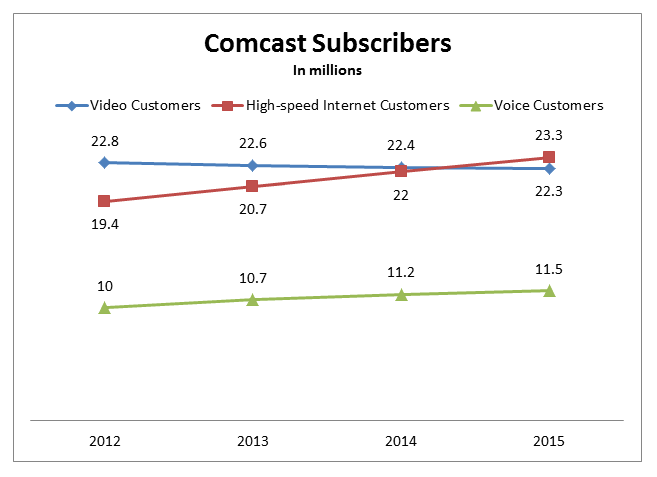 From the downward trend of video customers (blue line), it is clear that Comcast is facing the problem of cord cutting. For first time in 2015, the number of high-speed internet customers has surpassed the number of video customers. Dish, on the other hand, had a combined 14.517 million subscribers to its pay-tv and broadband services as of September, 2015. Although the 14.517 million customers is a 0.3% decline from 14.555 million customers recorded on December 31, 2014, the final annual number of subscribers for 2015 will most likely be higher than the number recorded in 2014, going by the past trend. Just as in Comcast’s case, the subscriber trends in Dish’s customer base are not visible in overall data but in segment data. Comcast and Dish both recognize this and have started their own or invested in online streaming services to maintain their subscriber base and compete with Netflix. Comcast through NBC has a 33% stake in Hulu (a joint venture between ABC Television, Fox Broadcasting and NBC Universal) while Dish launched its own streaming service called Sling TV. On pricing, Comcast’s Hulu has the edge over Dish’s Sling TV because it charges a lower subscription fee which will enable it to remain competitive as increased competition (primarily from phone companies) creates downward pricing pressure. For instance, Verizon launched its own free mobile streaming app—Go90. However, for now, Sling TV can justify its higher subscription on the basis of better content, i.e. offering sports in addition to other content that Hulu does not have. Hulu charges $7.99 per month for its basic plan, which increases to $8.99 if you add ShowTime and to $11.99 for the no-commercials plan. Sling, on the other hand, charges $20 per month for its starting plan to which you can add extra packages for $5 more and HBO for $15 extra. Hulu’s $7.99 is more competitive for price-conscious clients who don’t care about sports; Sling TV will win with sports fans, despite the higher monthly cost. Although Comcast is offering sports on its WatchESPN app, a customer has to have a cable subscription to access it. Comcast does not charge for the app independently, instead making it an additional feature to a customer’s traditional subscription. On balance, I believe that Comcast is better positioned than Dish here because it already offers attractively priced products that can weather a more competitive environment. Sling TV may be forced to lower its pricing as Verizon and other companies get into the streaming space. While Sling TV currently has an enticing content package, especially for sports fans, Comcast could easily add sports to Hulu from its WatchESPN app. For those customers in the red area, Sling TV’s target, $20/month for access to sports and other channels may be a more attractive option than traditional pay TV options. Since there are fewer broadband providers in the red areas, Dish can charge the price $20 and continue to grow its subscriber base. Hulu, on the other hand, targets better-served urban areas, thus must offer prices that rival those of its peers like Netflix. Hulu’s basic plan starts at $7.99 per month which is the same price as Netflix’s basic plan. In addition to targeting urban residents, Hulu’s marketing (and to some extent, content) aims at price-sensitive younger consumers who are more likely to be the cord cutters or cord nevers (those who never subscribed to cable in the first place). 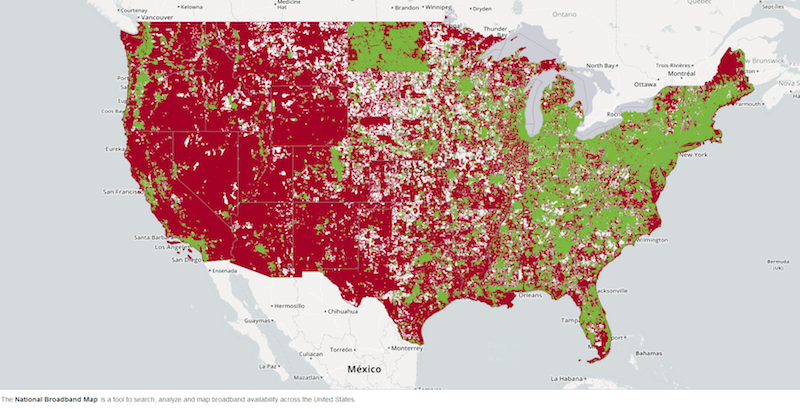 Dish can more easily corner its underserved and less competitive rural market than Hulu would be able to dominate its better served and more competitive urban market. On top of its dominance in rural areas, Sling TV is also a player in urban areas because it is seen as a cheaper option to expensive traditional pay TV subscriptions, especially among those looking to reduce their TV bill and still retain sports. Based on target markets/customer, Dish has a better outlook than Comcast. However, the worrying headwind for Dish is the declining size of the rural population which fell from 21% of the total population in 2000 to 19.3% in 2010 while the urban population rose from 79% to 80.7% according to the Census Bureau. Both reliability of the content delivery network and customer service are essential for attracting and retaining subscribers. According to JD Power, Dish ranked among the best in its 2014 customer satisfaction indexwhile Comcast placed below average. Dish has made having great customer service one of its top priorities and selling points, whereas Comcast has largely neglected it. Comcast acknowledges that it has 55% service area overlap with direct broadcast satellite providers (according to their most recent 10K) but still hasn’t made customer service satisfaction a top priority. Nonetheless, Comcast has the advantage when it comes to reliability of service because cable is less likely to be affected by weather and architecture. Dish is slightly disadvantaged because satellite dishes need a clear line of sight to satellites to function properly hence they may not work well in places where there are tall buildings or where the weather is bad. Additionally, satellites face significant risks in space, such as power systems failure, meteoroids, et cetera. A counterpoint to Comcast having the advantage on reliability, at least in urban areas, is that as more people are using cable (as a result of the growing urban population) internet speed reduces. However, I do not think this should be too much of a concern because of the following point about capex. Comcast spends more on capital expenditures than Dish which increases its potential future cash flow. In 2015, Comcast spent more on capex as percentage of sales (12.9% Cap Ex as a % of Sales) than Dish (which only spent 7.3% Cap Ex as a % of Sales). Comcast’s high capital expenditure as a percentage of sales enables it to continue upgrading its hybrid fiber and coaxial network to a fiber-optic network which gives it better capacity to take on new subscribers and provide additional services for existing ones. In the final analysis, I think Comcast can handlle cord cutting better than Dish. It beats Dish on price, reliability, urbanization trends, and capex, while Dish has the edge over Comcast on customer service, target market, and content. Both sides are important, but Comcast’s advantages over Dish will be harder to erode than the advantages that Dish holds over Comcast. For instance, Comcast is attempting to improve its bad customer service reputation—customer service expenses increased 7.8% in 2015 compared to 5.2% in 2014. Additionally, Dish’s advantage in cornering rural areas is slowly being taken away because of urbanization. Furthermore, its advantage on content would be largely undermined if Comcast added sports to Hulu, which it has the ability to do. All this gives Comcast better future prospects than Dish, however, we still need to look at valuation, profitability, and technical metrics to predict which, if either, of the two stocks would make for a good investment. For that view my Side by Side Comparison Webinar.